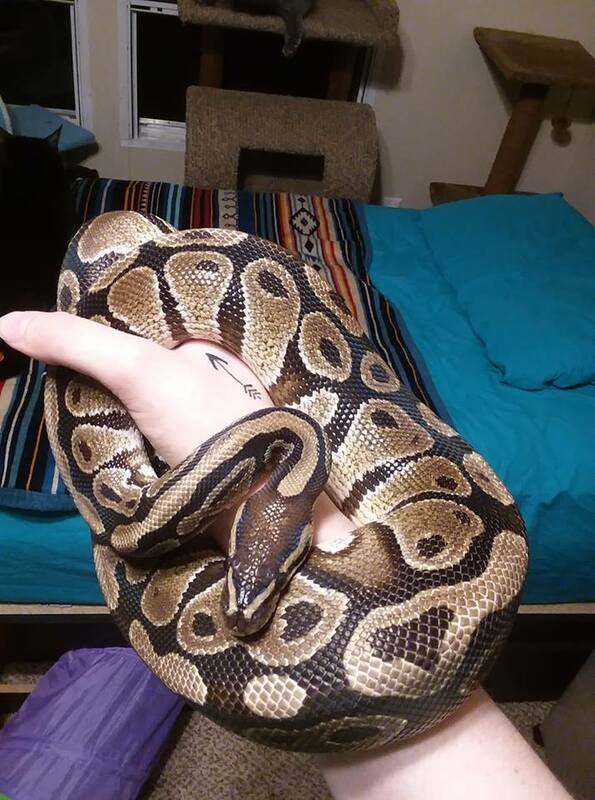 I'm concerned about my adult male ball python. He's been having full body spasms for a few days now and I can't begin to fathom why. I took him to the vet and my vet couldn't think of anything either. She said it could be IBD but it wasn't likely because the ONLY sign he's showing is the awkward full body spasms. It's not the normal, 'don't touch me' twitch that they sometimes give off either. The only thing she could think of is maybe he's stressed? I'm babysitting a few snakes (mostly ball pythons, but also a few colubrids) for a friend and she said even though he can't see them that he could smell them or something and that could be stressing him out. I've noticed though that it usually happens when I pick him up (i.e. to take him out of his tub for cleaning or bring him closer to me because he's trying to escape off the back of my chair and I have cats) or put him down back in his enclosure. He's just a normal morph, not a spider or anything fancy. I moved him into a 40 gallon breeder today in hopes that that will help because his old tub was too small (though he'd been in that for nearly 5 months with no problem). His heat is fine, 90-95 on the warm end, and he's never had any issues shedding. He eats fantastic once a week--small rats for right now until I use up the last of them and move him to mediums. He was a rescue that a friend gave me and was underweight when I got him but he's 1400 grams ish now. He's only done this once before, about 3 months ago, when I used to work at a pet store and brought him up there for a 'Meet the Critter' day. I haven't brought him up there since and don't mess with him a whole lot other than to clean his enclosure and sometimes have him on me when I'm watching a movie at home. He doesn't spasm every time I go to pick him up or put him down either. I picked him up once at the vet and he was totally fine (albeit after spasming when I tried to take him out of his pillow case at first and then again when he was out and I went to pick him up the first time). The vet touched all along his spine to see if it was a pain reaction and he did react a bit (just a 'someone's touching me' muscle tense) when she got to a certain point, but then she had me do the same and not even a twitch. I just... I don't understand and I'm worried about him because I KNOW it's not normal behavior. yet to be studied, they just aren't a high priority, unfortunately. I'd keep him 'low-stress' for sure...you might never get an exact answer to what this is. Last edited by Bogertophis; 12-17-2018 at 06:17 PM. How long have you had him in all? Do you live in an apartment or rental that could be sprayed for pests when you're not home (& the snake is...)??? Is there any pesticides or volatile chemicals in his vicinity now, or were there ever? How about paint? furniture stain? Last edited by Bogertophis; 12-17-2018 at 06:49 PM. I use Natural Chemistry Healthy Habitat to clean his cage and I live with a roommate who owns the house, so no one ever comes in to spray pesticides in my room... In fact, I'm pretty sure there are no pesticides or anything beyond Pine Sol being used anywhere in the house or vicinity of. The last time his temp could have gotten that high (I estimated it got to that temp because my room gets hot sometimes) was during the summer. It usually stays about 80-85, lowest I've seen is 77. He's never had mites so I've never had to treat him. As far as I've known, he's only fallen once and that was yesterday when he spasmed when I had to take him out because he got his towel sopping wet overnight and he landed in the litter box for 2 seconds on his belly (he's on aspen now in the 40b). Vet didn't do an x-ray or even suggest it (her and the vet tech were pretty scared of him because when they told me to put him on the ground to see him move, he struck at her once). I don't smoke and no one in the house smokes, plus his breathing looks normal. I fed him yesterday and he ate perfectly fine, just like normal. I've had him.... Since roughly April 2018. So about 9 months. There was no plug in air fresheners close by or anything ?? I mean, I sometimes have a Renuzit open or use my wax warmer or light an incense cone. But would that really cause full body spasms? I had my male for 6 years before I decided to breed him to the females. He only occasionally did that "get off twitch". Once he got to be around the girls, though, whew !!! Every time I tried to lift him out of the tub his whole body would arch and he tried to literally fling my hand off of him. Once picked up he would buck hard enough to almost jump out of my hand !!! He was soooooooooooo TOUCHY during that time. After three or four bucks he was usually done after picking him up. He stopped doing that after breeding season. Went back to normal. I've had a few snakes do that "back off" fling with their body. Even seen them bounce small rodents off of them. But the only time I've seen this so extreme was in my male. During breeding season. Is one of the snakes you are watching a female ? Could you have handled a female and then, while her scent was on you, handled the male? They certainly can smell a female, one nearby, and on you as well. Maybe he is in breeding mode and moody and twitchy. Of course you need to rule out any overheating, toxins, etc. symptoms (like spasms) but when my vet x-ray'd her, it showed she'd had a back injury. Still think an x-ray might be a good idea, pity your snake scared the vet. Snakes that are put on the floor/ground frequently feel extremely defensive because suddenly we're looking so huge & menacing...it's typical for snakes. whole story (if they know), minimize what issues they know about, or have no clue what's going on either. Sounds to me like maybe a second vet opinion, someone more experienced with snakes? No way we can tell you what this is...only help you speculate here. BTW, don't use Pine Sol around snakes (fyi & I'm not saying you did)...it's in the same category as cedar shavings, very irritating & likely toxic to snakes etc. I mean, I'm sure there's at least one female in the bunch, but I haven't handled any of them except the massive female burmese python and I didn't handle him the same day. Do you know where I can find a video of a male ball python 'bucking'? It could be that potentially... I didn't know they did that. It just seems so unnatural like his whole body is thrashing around. Also, I haven't used Pine Sol in the room that he's in, but the homeowner uses it on the floors in the rest of the house. I can try getting an x-ray once I have some more money saved up or maybe another vet. And yeah, I figured that's why he struck. She got down on his level to look at him more closely and he struck, but he's never done that before and he only did it once. Likely just intimidated. Makes sense. Last edited by Hawkshadow; 12-17-2018 at 07:52 PM. & birds are typically more sensitive than snakes to stuff.